Sunday December 18th 1881 It was a very pleasant day, I went to church. I read some in the afternoon and wrote in the evening. 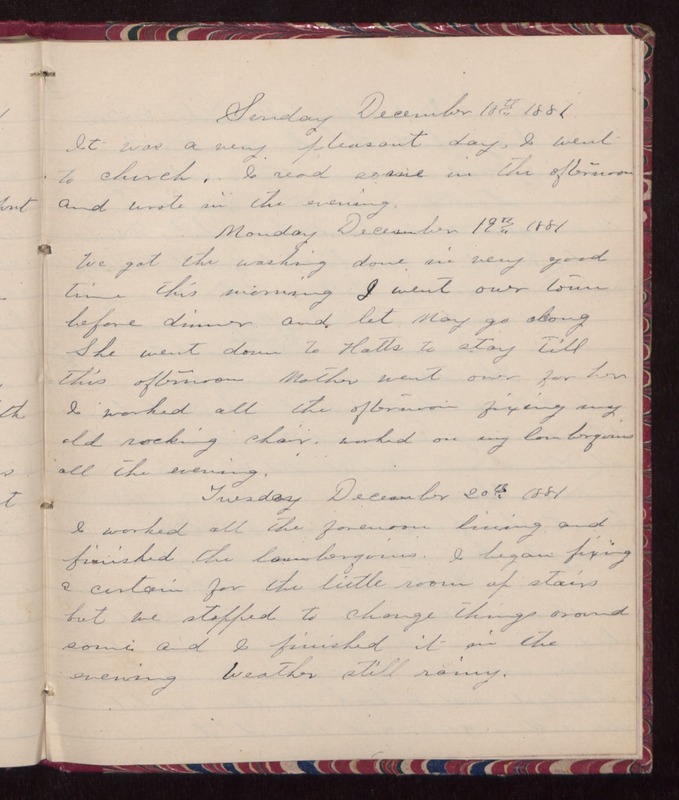 Monday December 19th 1881 We got the washing done in very good time this morning. I went over town before dinner and let May go along. She went down to Hatts to stay till this afternoon. Mother went over for her. I worked all the afternoon fixing my old rocking chair. worked on my lamberquins all the evening. Tuesday December 20th 1881 I worked all the forenoon lining and finished the lamberquins. I began fixing a curtain for the little room up stairs but we stopped to change things around some and I finished it in the evening Weather still rainy.